Tart Cherry Ultra / 90 Veg caps - Nature's Way®. Take 3 capsules daily. If pregnant, nursing, or taking any medications, consult a healthcare professional before use. How much tart cherry goes into Tart Cherry Ultra? While it’s difficult to compare to Tart Cherry concentrates, we can make an equivalent comparison to cherries. Our tart cherry supplier uses 95 pounds of tart cherries to make one pound of the concentrate used in Tart Cherry Ultra. 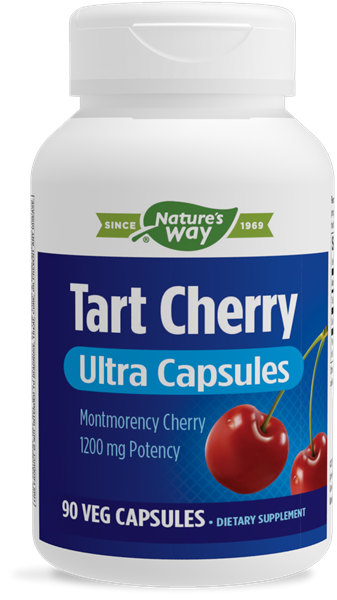 That translates into each bottle of Tart Cherry Ultra being equivalent to 7.5398lbs of tart cherries—or approximately ¼ lb. of tart cherries per serving (7.5398 divided by 30 servings per bottle).